Light Emitting Diode (LEDs) lights are very small, extremely durable, and can be manufactured in a variety of colors and forms. They have the potential to be more energy efficient and last far longer than most current lighting technologies. They are considered environmentally friendly, since they contain no mercury, and the visible light applications for home or business do not emit infrared (IR) or ultraviolet (UV) light. They produce very little heat, and their lifetime is not affected by frequent on/off switching. The cost of materials needed to make LED lighting has plummeted in the past several years. Although LEDs remain more expensive than their counterparts, their prices are steadily declining. CCT: Correlated Color Temperature, a measure of the color appearance of a light source; CCT is measured in degrees Kelvin (K), the absolute temperature scale; white light products commonly range from “warm white” (2700K) to “cool white” (5000K). CFL: Compact Fluorescent Lamp (lamp is the lighting industry’s term for bulb). CRI: Color Rendering Index, a measure of how a standard series of colors appear under a light source, compared to a reference light source (daylight or incandescent light); CRI is measured on a scale of 0 to 100, with 100 being identical to the reference light source. Diode: A simple semiconductor device. RGB: Red-Green-Blue, the three primary colors of light. Semiconductors: Solid materials that possess electrical conductivity. SSL: Solid State Lighting, a general term for semiconductors that convert electricity into light. White light: Not an actual “color,” but rather a combination of all wavelengths in the visible spectrum of light. Light Emitting Diodes (LEDs) are part of a class of lighting called Solid State Lighting (SSL). Unlike incandescent or compact fluorescent lamps (CFLs), LEDs are small electronic components that convert electricity into light. Organic light–emitting diodes (OLEDs) and light–emitting polymers (LEPs) are also forms of SSL. LED applications allow for extraordinary flexibility in lighting design with regard to color, brightness, size, shape, and distribution. There is even a fabric with solid state lighting incorporated into the weave—imagine t-shirts with designs that change shape and color, or a sofa in an airline terminal with a digital clock displayed across its cushions! The technology is new: LED technology is developing fast; new generations of LED devices appear every 4-6 months. This past year’s LED light may well be outdated by now, with newer models providing better quality light more efficiently. OLEDs are the newest in SSL technology. The technology is different: Because LEDs are completely different from traditional lighting sources, standards and testing procedures were implemented by the ENERGY STAR® program (a collaborative effort of the U.S. Department of Energy and the Environmental Protection Agency) in June 2008 in the interest of making it easier for consumers to compare products. Everyone’s learning: Because LEDs can be sensitive to some thermal and electrical conditions, manufacturers are racing to develop fixtures or components that are LED compatible in multiple applications. Ongoing research in LED lighting is happening right now all around the world. Governments and private industry are extremely interested in LEDs both because of their great adaptability in design and the potential energy savings that LED lighting offers. According to ENERGY STAR “Lighting accounts for 12-30 percent of energy use in the U.S. To put this into perspective, in a home that 12 percent is more energy than your refrigerator, dishwasher, and clothes washer uses combined!” LED lighting has the potential to revolutionize home, office, retail, and architectural lighting in the coming years—and that includes general white-light illumination. If you are interested in the history of the discovery and development of LEDs and OLEDs see the Edison Tech Center’s website. LEDs differ from traditional light sources in the way they produce light. In an incandescent lamp, a tungsten filament is heated by electric current until it glows, emitting visible light. In a fluorescent lamp, an electric current causes the gas inside the tube to emit ultraviolet (UV) radiation, which strikes the phosphor coating on the inside of the glass, causing it to emit visible light. An LED, on the other hand, is a semiconductor diode, a device that allows current to flow in only one direction. 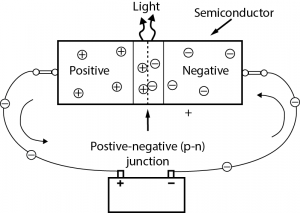 It’s made of a chip of semiconducting material treated to create a structure called a p-n (positive-negative) junction. The positive side contains excess positive charge (“holes,” indicating the absence of electrons) while the negative side contains excess negative charge (electrons). 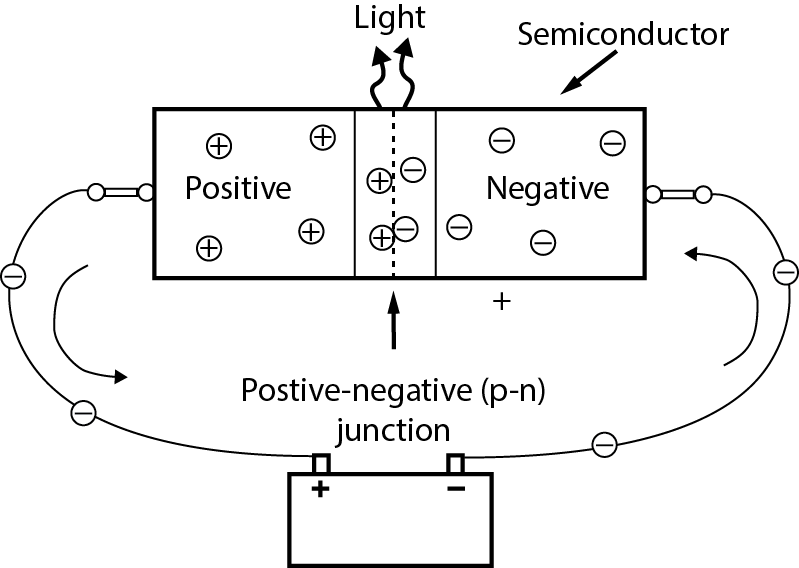 When current is applied, the negatively-charged electrons move toward the positive side, and the positively-charged “holes” move toward the negative side. At the junction, the electrons and holes combine. As this occurs, energy is released in the form of light that is emitted by the LED. Depending on the alloy used to make the semiconductor, the light emitted by the LED can range through the colors of the rainbow: red, orange, yellow, green, and blue. “White” light is created by combining the light from red, green, and blue (RGB) LEDs, or by coating or shielding a blue LED with yellow phosphor. For another explanation on how LEDs and OLEDs work, watch the video on the Edison Tech Center’s website. How Does the Light Produced by LEDs Compare to that of Incandescents and CFLs? White light is a combination of all wavelengths in the visible spectrum. Incandescent lamps inherently produce white light. LEDs do not. They emit light in a very narrow range of the spectrum, producing nearly monochromatic light—the color depending on the materials used to create the LED. “White light LEDs” are created in two different ways: phosphor conversion or RGB. In phosphor conversion, a blue LED is coated with a yellow phosphor or the phosphor coating is bonded to a substrate that is at a distance from the LED, resulting in light that appears white to the eye. This method is lower in cost than the RGB approach. Phosphor-converted chips are manufactured in large quantities in forms that are integrated into lighting fixtures. In the RGB method, white light is produced by mixing the light from multiple red, green, and blue LEDs; sometimes amber is added to enhance the quality of the light. This results in great flexibility in the possible “shades” of white light produced, but is technically more demanding to manufacture, and thus more expensive at this juncture. RGB systems are generally found in custom-designed architectural, home, retail, theater and medical lighting. Remote controls and smart-phone apps are available to adjust the color scheme to fit the environment. Before the 1990s white light through diode phosphor-conversion or RGB method was not possible. The invention of efficient blue light-emitting diodes in the early 1990s by Isamu Akasaki, Hiroshi Amano, and Shuji Nakamura won them the Nobel Prize in Physics in 2014 and enabled the creation of bright and energy-saving white light sources. Light quality is indicated by two measurements, correlated color temperature (CCT) and the color rendering index (CRI). CCT is that aspect of light that people refer to when they talk about “cold” fluorescent lighting; such lighting has a high CCT. CCT is measured in “Kelvins”; cool white light is 5000K, while warm white light has a low CCT at about 2700K. Until recently, most white light LEDs had very high CCTs, often above 5000K, but warm white LEDs are now available. They are slightly less efficient than cool white LEDs. The CRI is a measure of how color appears when illuminated by a light source compared to reference sources such as incandescent light or daylight. A CRI of 100 is identical to the reference source, so the higher the CRI the better. Everyone has experienced the dull colors and washed-out faces resulting from old-style fluorescent tube lighting, which had a CRI ranging from 50 to 60. Phosphor-converted warm white LEDs are now being produced that claim to have a CRI of 80, a value most people find quite acceptable. Others exceeding 90 also have been reported. To create more consistency of light quality in the manufacture of LEDs, a process called “binning” is used. In the production of LEDs, a single round wafer is coated with various materials to create the semiconductor which forms the blue LED. This is then sliced into extremely small rectangles (die). Electrical connections are inserted and the phosphor is added as a coating or on a shield. The coating processes (die and phosphor) create significant variations that impact the lumens, color temperature and voltage of the LEDs. LED manufacturers sort their production into lumen, color and sometimes voltage bins (binning). This allows luminaire manufacturers to select only those LEDs that meet their acceptable performance ranges while maximizing the usage of each of the bin ranges for the LED supplier. The CRI has been found to be inaccurate for white light RGB LEDs, and there is controversy in the industry as to the reliability of the rating for other lighting types as well, so a new measurement system is under development. In terms of illumination, “LEDs are “directional” light sources, which means they emit light in a specific direction, unlike incandescent and compact fluorescent bulbs, which emit light and heat in all directions. For this reason, LED lighting is able to use light and energy more efficiently in many applications. However, it also means that sophisticated engineering is needed to produce an LED light bulb that shines light all around like an incandescent A-shape bulb” (Learn About LED Bulbs). It depends. The best white light LED lamps can meet or exceed the efficiency of compact fluorescent lamps—but many LEDs currently on the market do not. LEDs are sensitive to temperature and electrical conditions, and LED fixtures must be designed carefully to take this into account; many manufacturers are not yet experienced in such design. According to ENERGY STAR “thermal management is probably the single most important factor in the successful performance of an LED product over its lifetime because the higher the temperature at which the LEDs are operated, the more quickly the light will degrade, and the shorter the useful life will be”. The U.S. Department of Energy estimates that the energy efficiency of LEDs already rivals the most efficient white light sources. The ENERGY STAR website states “that Solid-State Lighting (SSL) is the future of lighting”, and thanks in part to ENERGY STAR it’s here. Energy Savings: ENERGY STAR certified LED bulbs use 70-90% less energy than a standard incandescent bulb. Money Savings: A single ENERGY STAR certified LED can save more than $135 in electricity costs over its lifetime. Affordability: The prices for ENERGY STAR certified LEDs are dropping big time—as low as $5 per bulb with in-store rebates. Long Lasting: ENERGY STAR certified LED bulbs now look and light more like traditional bulbs, but can last 25 times longer—over 20 years total with typical use. Quality and Performance: An ENERGY STAR certified bulb will give you the best LED experience. Only bulbs with the ENERGY STAR are independently certified, undergoing extensive testing to assure that they perform as promised. To earn the ENERGY STAR, these bulbs must demonstrate that they will meet consumer expectations by delivering on brightness and producing light in all directions. Peace of Mind: ENERGY STAR certified LED bulbs carry a three-year warranty. Environmental Protection: By replacing 20 million traditional incandescent bulbs with ENERGY STAR certified LEDs, this country would save more than $118 million each year in energy costs, and prevent greenhouse gas emissions equivalent to that of more than 150,000 vehicles. The ENERGY STAR label on SSL luminaires provides consumers with the confidence that these products meet efficiency and performance criteria established by DOE in collaboration with industry stakeholders. The ENERGY STAR SSL program went into effect on September 30, 2008 and the ENERGY STAR Lamps Version 1.1 specification took effect September 30, 2014. ENERGY STAR is focusing on lighting applications and products for which the technology has advanced to a point where performance is equal to or better than traditional efficient lighting technologies based on light output, luminaire efficacy, and cost. The focus on quality will go a long way to ensure that consumers have a good experience with this technology.” Visit the ENERGY STAR website for LED certified bulbs and luminaries. See the Building Technologies Program site for more information. Exciting research in SSLs is ongoing world-wide through industry, research and educational institutions. Light extraction is an important factor in SSL manufacturing and nanotechnology has been at the forefront of creating new materials and structures to improve brightness. OLEDs are the next innovation for home lighting. Imagine an entire wall or ceiling that glows or windows that simulate daylight once it’s dark outside. In research beyond lighting applications, the LED is being used to deliver networked, mobile, high-speed communication in a similar manner as Wi-Fi. Harald Haas’ (a professor of engineering at Edinburgh University) latest work transmits data via an LED bulb that glows and darkens faster than the human eye can see. And by using the LED lights on electronics as Internet access points, we come closer to realizing the “Internet of Things”. Besides providing bright, energy-efficient lighting for the average home occupant, the LED lamp holds great promise for increasing the quality of life for more than 1.5 billion people around the world who lack access to electricity grids for their homes. Due to low power requirements, LED lighting can be powered by local solar power or a battery. Simple LED lights can replace the kerosene lamp, which in turn eliminates expensive fuel costs and the health hazard of kerosene’s toxic fumes. The web article “A homemade solar lamp for developing countries” provided online by Ecole Polytechnique Federale de Lausanne about the social startup LEDsafari is a good example of providing people with hands-on education to create their own LED lights from materials at hand (wire, phone battery, LED, empty bottle). Today consumers can comparison shop for LED white lights the way they now do for incandescent and compact fluorescent lights, choosing the lamps and fixtures that give them the combination of light quality and energy efficiency they’re looking for. LEDs are already available for multiple applications in and around the home—from landscape and walkway lighting to holiday lighting to everyday home lighting, and even ambient lighting in hard-to-reach places where the long life of LEDs is a real asset. The future is looking brighter every day. Carron, C. (2014, April 14). A homemade solar lamp for developing countries. Phys.org. Edison Tech Center. (n.d.). The Electric Light: LEDs and OLEDs. Retrieved April 17, 2015. Hass, H. (2011, July). Wireless Data from Every Light Bulb. TEDGlobal 2011. Lighting Design Lab. (n.d.). Introduction to LEDs. Retrieved April 16, 2015. Lighting Research Center (LRC). (n.d.). LEDs. Retrieved April 28, 2015. National Institute of Standards and Technology, Physical Measurement Laboratory. (n.d.). Color rendering of light sources. Retrieved April 10, 2015. Nobelprize.org. (n.d.). The Nobel Prize in Physics 2014. Retrieved April 22, 2015. Toolbase.org – Home Innovation Research Labs. (n.d.). LED Lighting. Retrieved April 15, 2015. U.S. Department of Energy (DOE) ENERGY STAR. (n.d.-a). ENERGY STAR Certified Light Fixtures. Retrieved April 22, 2015. U.S. Department of Energy (DOE) ENERGY STAR. (n.d.-b). Learn About LED Bulbs. Retrieved April 16, 2015. U.S. Department of Energy (DOE) ENERGY STAR. (n.d.-c). Solid State Lighting (SSL) Luminaires. Retrieved April 17, 2015. U.S. Department of Energy, Office of Energy Efficiency & Renewable Energy. (n.d.-a). Solid-State Lighting. Retrieved April 28, 2015. U.S. Department of Energy, Office of Energy Efficiency & Renewable Energy. (n.d.-b). SSL Basics. Retrieved April 14, 2015. U.S. Department of Environmental Protection (EPA) ENERGY STAR. (n.d.). ENERGY STAR Certified Light Bulbs. Retrieved April 22, 2015. This document is FCS3280, one of an Energy Efficient Homes series of the Family, Youth and Community Sciences Department, Florida Cooperative Extension Service, Institute of Food and Agricultural Sciences, University of Florida. This material was prepared with the support of the Department of Environmental Protection, Florida Energy Office, which is now the Florida Department of Agriculture and Consumer Services (FDACS), Office of Energy. However, any opinions, findings, conclusions, or recommendations expressed herein are those of the author(s) and do not necessarily reflect the views of FDACS. Original publication: June 2008. Revised March 2012 and April 2015. Please visit the EDIS website. Barbara Haldeman, editorial assistant, Program for Resource Efficient Communities; Wendell A. Porter, lecturer and P.E., Department of Agricultural and Biological Engineering; Kathleen C. Ruppert, Extension scientist, Program for Resource Efficient Communities; Randall A. Cantrell, assistant professor, Department of Family, Youth, and Community Sciences; and Christine Swanson, program assistant, Program for Resource Efficient Communities, Florida Cooperative Extension Service, Institute of Food and Agricultural Sciences, University of Florida, Gainesville, FL 32611.